LOL! Well she's no Bae Doona. Looking forward to watch Episode 8. I havent watch ep 7 yet but adding veterinary dept is definitely Pres. 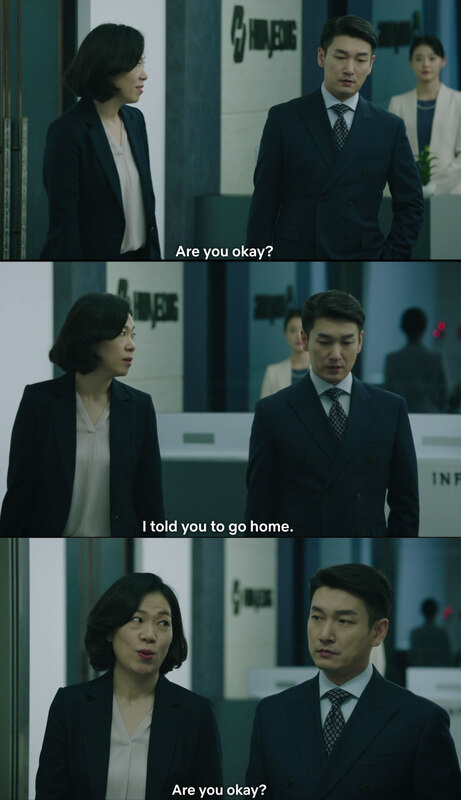 Goo calculated moves If you remember the scene when the reconstruction team manager present his finding on the financial status of the hospital to Mr Goo and his secretary in ep 5, his secretary accidentally told him about the medical cost for her pet was expensive and its dont covered by insurance. While there is emotion part exist in his reactions , till ep 6, all his decision shows that he is placing the business point of view as a decision point. After rewatching ep5, i realise that even the transfer cancellation is also a business moves.The way CJW layered his emotion and character is really on the other level. Article: Naver 'Life' Won Jin Ah to Jo Seung Woo, "I've been waiting for someone like you." Don't put in any love line. Just leave Director Gu as a working ant!! the Director's secretary now is so good too. She has a sense of justice. This drama is crazy, really. Don't add in any love line that we can't get immersed into. Won Jin Ah being the Ye brothers' nuna is awkward. Her love line with Director Gu seems forced too.. Who goes to the Director's office at night to show him acts of kindness. And her acting isn't stable too. When she was asked if she had left something behind, No Eul points at Gu Seung Hyo. I was seriously thinking if I'm watching the right drama.. If the love line was built up properly that it makes sense, I won't say such a thing.. But all of her actions toward the Director doesn't make any sense at all.. They might do this if this is a melodrama, but the genre of this drama isn't melo..
As soon as No Eul appears, the genre of this drama changes.. I won't mind it if this can be passed off easily. But it's not that way.. Scriptwriter, No Eul's character and the love line that has No Eul in the middle of it, none of them makes sense. I'm enjoying this drama. But if No Eul character goes wrong, it would seem like she's flirting! Not easygoing. At that age, that kind of looks, and that job, she should be well aware that she's pretty and doing well, isn't she? Lee Dong Wook and Moon Sung Geun was jjang! I wonder who saw the conversation between working ant and Glutton. So Ye Jin Woo has started taking action. This is getting more interesting. Lol why KNetz didn't favor the love line. That is my favorite part Apology, this ahjumma is shallow, but come on! Aren't they the cutest ? but on the serious note, it just shows that he's also a man, drawn into a woman, who not only the sweetest, probably a smart one as well. I will enjoy their sweet-but-awkward interaction while it lasts. It's been a while since CSW kiss a girl lol. Totally agree I think the romance is also in so small doses that it doesn't affect the story but adds to it. Does anyone watching live? Do u have the link ? If you do some rough recap I would appreciate that..otherwise no problem. Thanks. @bedifferent @bebebisous33 Watched eps 5 , while I am unsure about the romance between Goo and LNE ( perhaps too early to tell ) , I do like that she is not judging him the way the others are because she herself is a witness of things being swept under the carpet . While others are unhappy that he is shipping them off to the rural areas purely for a profit motive , she saw the rationale in his explanation of there being an imbalance in medical services in the smaller towns & villages. I thought it was pretty smart of her to change a person’s mind by reaching to them emotionally & gently, as opposed to the offensive industrial action that the rest of the staff are taking. By bringing him around the paediatric ward she’s showing him that he needed to look at the hospital and it’s departments as more than just profit centres & revenue streams. Like what JKM brought up at the end of the episode , the losses of many public Hospitals are only a small fraction of the state/ public Budget but yet many are closed down as they are evaluated based on profits . The consequences of that would be the lack of affordable medical services for the poor and underserved. The million dollar question is whether the performance of Hospitals and medical staff should be evaluated using the same KPIs as other industries. While I understand that Sangkook here is a private entity where profits would remain its chief objective, I wonder if the point of the drama is to find a middle ground where ethics, compassion etc do not have to be compromised for the sake of money. Goo will be poised with a moral dilemma of sorts soon enough. I like that in eps 5 we got to see the mothers of the Ye brothers and also Goo. I often look at the interactions between Mother & Son as an indicator of the sort of person our protagonists are deep down. In this case , I think both YJW & Goo have a strong anchor in their mums, so I have faith both will end up on fighting for what’s right. I also like watching scenes of JW & SW. very interesting relationship- there’s great love between the two but yet a wall is there. SW does not want to be a burden to jW , and he isn’t honestly but yet JW takes it upon himself to over protect him. SW knows this & lets it be because he understands the burden JW carries in his heart. I agree completely. Maybe im a sucker for romance, but I don’t want writernim to get rid of the love lines. I even kind of ship NE and dr ye even though he also looks cute with the reporter and the dynamic of NE and Goo is engaging too. Glad I was not the only one who dislikes Won Jin-Ah's acting, for a while I thought I was biased. Seems like my distaste was grounded and logic. Honestly, we've seen in the episode today more humanity in other characters than her character, who's , no offense for those who like her, corny. President Gu will not be inspired by SunWoo's humanity, but he will be touched by his night walks with Barbie NoEul. Talk about cheap methods to make her relevant and to ruin good plot. Barbie NoEul is out off the place- everyone is stressed, everyone worries about the new policy in the hospital or who will become the next director. But ofc, she is relaxed and makes jokes, firts with the president and the actress is not even that good. Call me a richard simmons, I admit I am, but I just hate each second I see her on screen or close to characters that are well written! Otherwise, loved the episode. So much humanity and well expressed shades of that - greed, anger, pity, sadness. I am liking how things progress and I am waiting for what's next. I love President Gu, how can one not love a complex characters that has so many layers of depth. I really liked when he noticed his secretary starts to know and read him, how he tried to stay away to not to judged. I also really liked to see him defeated, proved he is actually flawed and he is also stressed by his job just like any doctor is, that his status does not mean he is not lowly compares to his superiors. After all, he is like a piece that can be replaced anytime if he does not manage to do his job. Ye JinWoo starts to become constant in thoughts, movement and actions. I really hope the writer does chage this situation and makes him feel more varied emotions. I am sick of seeing Lee Dong Wook with a sad face, he has potential to do so much more! Also, where is that reporter, he seemed infatuated with her and I liked their chemistry. He needs fresh air and she would be a hot catch! SunWoo feels pain iss this a sign he will be able to walk again? I really hope so, that would be the greatest gift the writer-nim could give us! I hope he could be a doctor in the real sense of the word. Lastly, can we all agree that the old dude doctor, who screamed all the episode, is a pure narcissist ? I enjoy this show. I like all charactors *everyone* have the moment. I did not expect what to have or what to like from this show. This is my first medicial serie I have a try and time flies ! Its Ep8 already and looking forward to see next Ep to end. Ep8 surprise a lot / first I thougt JW is not much in this Ep but when incident happpend in that room. I see other side of his and again with also with reporter. GSH, gosh. This man hahaha. When I first saw the trailer he looked so scary, so cold, so evil, until I watched his interaction with Ms. Kang and when he tried to learn scissors type. Those scenes erased all my first impression of him. This man is secretly hilarious and I really love the writer for making a character like this. I am really glad that people around GSH are also amazing like Ms. Kang and SWC (when he playfully kicks GSH LOL). I love GSH and SWC bromance so much and GSH - Ms. Kang banter. More scenes, please! The thing is, let's compare ep 1 and ep 7. I feel like I'm watching a different drama. The atmosphere feels so different. And as much as I love soft GSH (he is super cute with his parents and dogs) I miss sharp-tongued GSH. I'm done with soft GSH now give me President GSH! Well, in ep 8 seems like everything will start to heat up again. YJW and YSW start to take action (don't forget their bromance here) and Dr. Joo, I hope he can get more screen time next week! The scene when GSH complained all the way to elevator about how the doctors keep making problems really cracked me up. Poor boi must fix all the mess the doctors created I can't wait for GSH - President Jo scenes again. Seems like GSH is getting pissed off by him. President Gu will not be inspired by SunWoo's humanity, but he will be touched by his night walks with Barbie NoEul. This. Please don't It would be so cliche if this happened. I see that many netizens don't like the love line. The love line hasn't ruined the plot so far in my opinion, so as long as the writer doesn't make it too much or too cheesy I'm okay with it. But I agree about LNE character. I don't hate her and I enjoy her interaction with GSH but I can't deny that her character is kinda bland so far. Like she is just there being kind to everybody and that's it. She is too "one-dimensional" for a complex character like GSH Also ep 8 ending makes me worry about love triangle. Please don't. OMG. What an episode today. I was nervios the entire episode. I had to pause it several times. Great story, the actors amazing. So happy for this story. Busy today. Have not watched E8. Welcome all newcomers to our little thread. 3. [+265, -10] Kim Chang Wan for 'White Tower', Moon Sung Geun for 'Life', although the other actors are good at emotional acting, there are times where their diction is a bit unfortunate but with Moon Sung Geun, whether he talks softly, yells, or is in a good mood, it flows into your ear(t/n: they're saying they're able to hear his lines properly). I watched in awe. @bedifferent thanks for the ratings...Just saying- LIFE obtained slightly higher ratings on the same episode of Stranger. I am saying this because I am scared that audiences drop this drama due to the love line. I love Stranger I love LIFE. I am not sure why some audiences do not like the love line or the interaction between President Gu and Dr. NE. I like it very much at least something different from her debut drama. I do hope that the love doesn't stop there at least make him and Dr. NE good friend who understand each other. Being a warm-hearted nature, Dr. NE is just being herself - he treats Dr. Ye Jin Woo with warm-hearted too. Probably some see her interaction with him is more than an employee/employer due to her style and smiling faces, I can understand that but I still believe that it is not her intention at all to flirt with him. She just interested to learn more about him and accept him as a better President. And furthermore, nobody from the hospital approaches President Gu the way she does...things she said make him reflect on what he is doing or at least that's what I hope. ## I want to add that: I think Dr. NE has touched President Gu soft sport - caring of child/kids - probably President has some issues/or past stories related to this and also by voluntarily joining "Volunteer Programme with President" - I am sure apart from the idea accidentally and unintentionally thrown by Secretary Kang , President Gu must someone who loves dogs very much. Anyway, thank you very much for creating this forum. I am actually a new member to this forum but not new to Soompi forum .. I agree with you about NE. I consider her role quite important because she is the only one who shows Mr. Gu that there are different kind of doctors. Notice that Mr. Gu has been more working with doctors like KTS, OSW or LSY (Cancer Center chief) who are quite arrogant and selfish. NE as a doctor is behaving differently: she treats him like an equal, shows him things that he didn't know without being condescending. Just because Mr. Gu is no doctor but a businessman, this doesn't mean that he is "stupid" or has less value than the doctors. Interacting with NE, he learns more about the hospital which can help him to see the problems... NE pointed out the waste of money with drugs (buying 100 mg but using only 20 mg in the pediatric department). There is room for improvement here. Unlike NE, all the doctors mentioned above are more interested in power that is connected to that Hospital director seat than the hospital itself. A random thought: Cho Seung-woo looks younger in casual clothes.